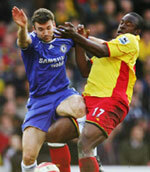 Salomon Kalou's injury-time header kept Chelsea in the Premiership title race as they drew on all their reserves to fight for a 1-0 win at Watford. Manchester United must have felt they had one hand on the Premiership trophy after The Hornets frustrated the reigning champions for all of 92 minutes at Vicarage Road. However, Kalou came off the bench to ensure that Jose Mourinho's hopes of a third title win in succession are still very much alive as Chelsea moved to within six points of United. The result was undoubtedly harsh on Adrian Boothroyd as he celebrated his second anniversary in charge of The Hornets, as his side gave a performance very much in keeping with his philosophy as they battled throughout and never let Chelsea settle at Vicarage Road. The start of the game was immediately interrupted by a head injury to Blues captain John Terry that - for a few seconds - evoked memories of his Carling Cup final injury before the defender clambered to his feet. The delay did not serve to dilute the intensity of the contest as Watford displayed a fearless spirit as they tried to take the game to the reigning champions. Terry was lucky not to give away a penalty after five minutes when Tommy Smith's cross struck his arm, and from the resulting corner Steve Kabba called Petr Cech into action with an acrobatic effort. Strike partner Darius Henderson then fired a volley over the bar from eight yards after Damien Francis's knock-down, as Boothroyd's men signalled their intent to battle for every point despite relegation remaining a likely prospect following victories for West Ham and Charlton prior to kick-off. Chelsea would also have been disconcerted by United's 4-1 win over Blackburn but, unsurprisingly, they did not display any visible drop in morale and Andrei Shevchenko fired their first effort at goal when his snapshot was gathered by Ben Foster. It was then Chelsea's turn to appeal for a penalty when Gavin Mahon caught Frank Lampard just inside the box, but referee Uriah Rennie evened things up by waving play on. The Blues' best opening of the first half came when Lampard's header found Didier Drogba unmarked in the box, but the Ivorian saw his shot on the turn expertly saved by on-loan Manchester United keeper Foster. The England international also repelled a hooked shot from Andrei Shevchenko before the half was out, and Watford certainly deserved to be on level terms with the two-time Premiership champions. Mourinho responded to a goalless first half by sacrificing holding midfielder Claude Makelele in order to introduce the more attacking Kalou from the bench, with Paulo Ferreira also replacing Geremi at right-back. The change did not do them any immediate favours as Watford should have gone in front after 51 minutes. The ball fell perfectly for Kabba in the box as Chelsea failed to clear, but the striker was guilty of a horrendous miss as he sliced his effort wide. The Hornets had picked up were they left off with a battling performance, and after enduring further frustration Mourinho made his third and final substitution before the hour mark with midfielder John Obi Mikel replacing Ashley Cole. On 67 minutes the entrenched contest sparked into life when Kabba burst down the right and delivered a good cross, but Francis was unable to get the necessary contact to beat Cech as he spun and shot. Less than 60 seconds later Chelsea should have taken the lead when Michael Ballack somehow contrived to miss the ball completely just yards from goal, and Jordan Stewart did superbly to block Shevchenko's secondary effort as Watford kept their illustrious opponents out. As the time ticked past 75 minutes, Chelsea knew that they were entering a crucial stage in their season and both Mikel and Lampard saw efforts repelled as The Blues sensed desperation sneaking in. Lampard - playing with protection on his wrist after missing England's midweek debacle - burst into the box again but an exceptional block from Jay DeMerit prevented him from testing Foster. Indeed, Watford could even have won the tie with just three minutes to go as Francis found space at the back post from a corner, but the midfielder was denied by a fine save from Cech. The save proved crucial as Kalou popped up in injury time to direct Shevchenko's cross past Foster and keep Chelsea clinging on in the title race.